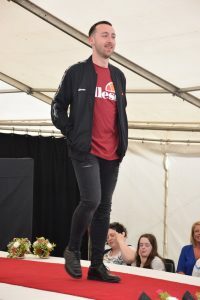 It’s the time of year for The Iverk Fashion Show, one of the top highlights of the show and it’s growing from strength to strength each year. This year our main sponsor again is Hicksons Centra in Piltown, and we value their support a great deal and we are delighted to have them on board for this great event. The fantastic Tracy Millea will compare the show, she is a valued member of the team and she always presents the show with great flare and gives the audience a detailed look at what’s on trend for the up-coming season. We are showcasing Autumn /Winter fashion’s from Carrick-on-Suir, Kilkenny and Waterford stores who are always willing to participate in this huge event. 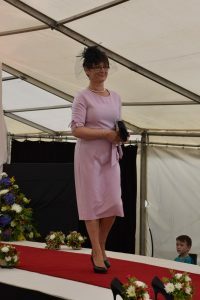 We also have valued Milliner’s showcasing their fantastic hats and headpieces which is a very popular slot in the show. Without our models, male and female, this event would not happen, they give up their time to take part and we appreciate it very much. Our busy fashion show team of Fiona Quilty (Pamela Scotts Waterford), Ger Greene (Benneton Waterford) and Anne Marie Power (Anne Marie Power & Co. Accountants) would love you to come along to the show, promising you the very best of fashion and millinery from local stores and a day out to remember. Ladies, ladies, ladies and there’s more. Don’t forget the Most Appropriately Dressed Lady competition. Let me tell you what the first prize is but keep it a secret!. The winner will receive a on night’s dinner, bed and breakfast in the luxurious 5* Merrion Hotel in Dublin AND the next day armed with a gift card of €400 to spend at Irish designer Louise Kennedy’s flagship store and a glass of champagne. Not bad, eh? ?